Do you need a working area and feel like you don’t have any space for it? 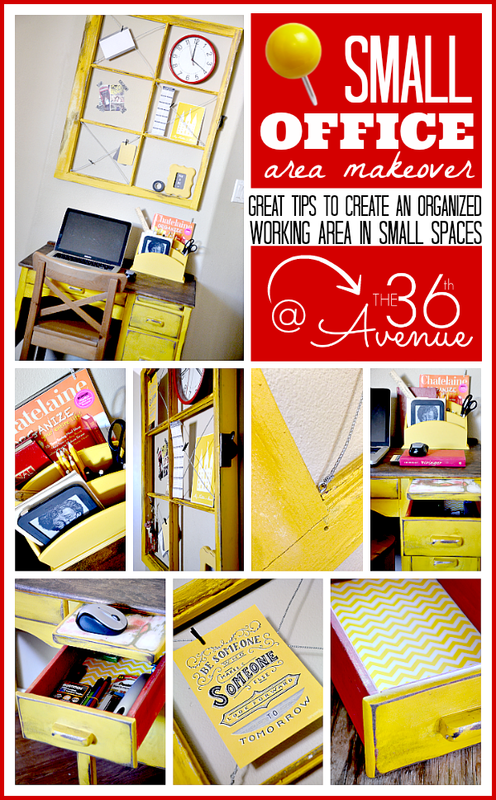 You don’t have to have a room to create an office space in your home. Today I’m going to show you how to turn a small area into a perfect organized working space for your computer. This can be a place to do homework, pay bills and even blog. 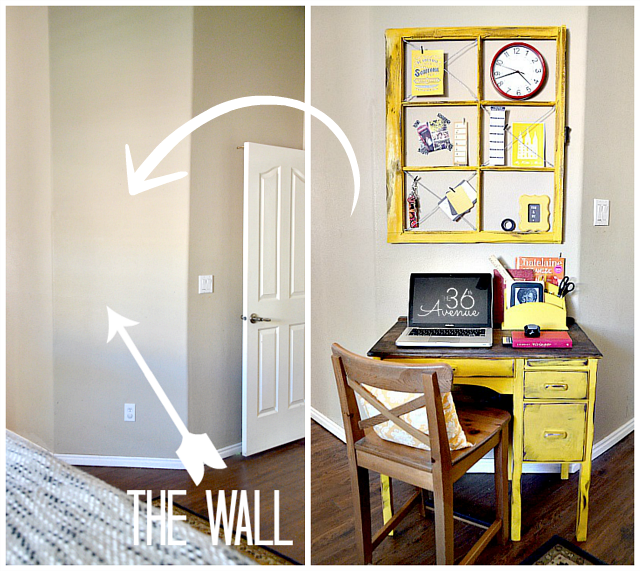 I created this small office right in our Master Bedroom. I am loving it and I use it all the time especially at night. I want to show you how small this space really is so you can see that you can really do something like this in a very tiny area. 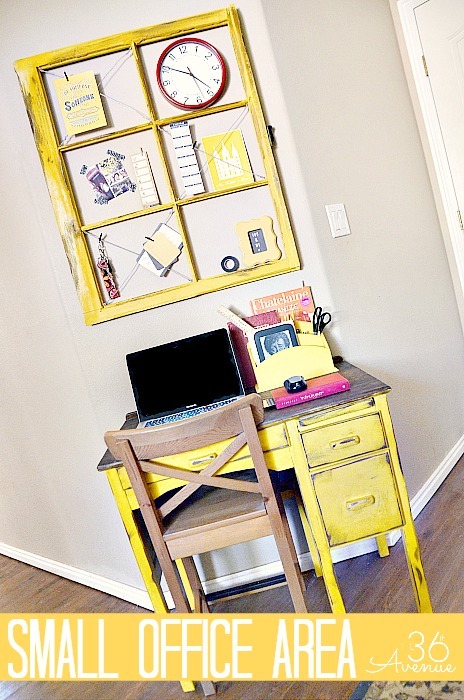 …to this little happy yellow office. 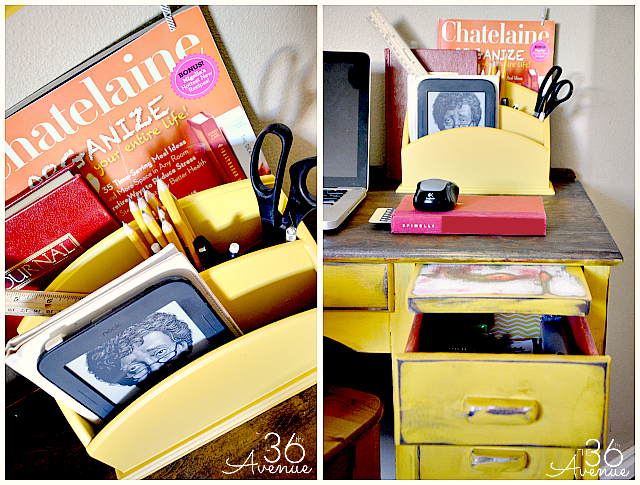 When you have such a small space you may want to look for a desk that has plenty of drawers. 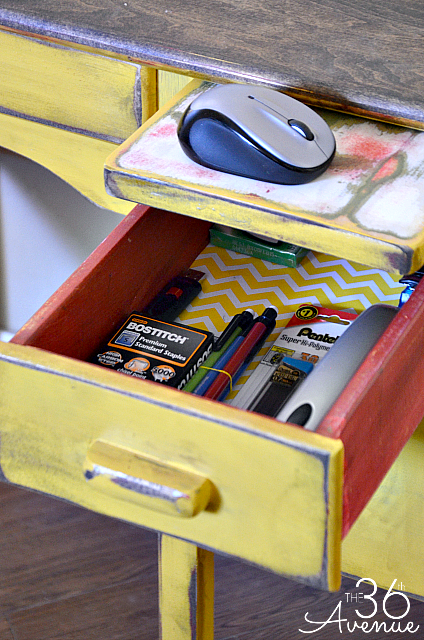 The first thing I did was to give my little red desk a makeover… you can click here to see how it used to look. 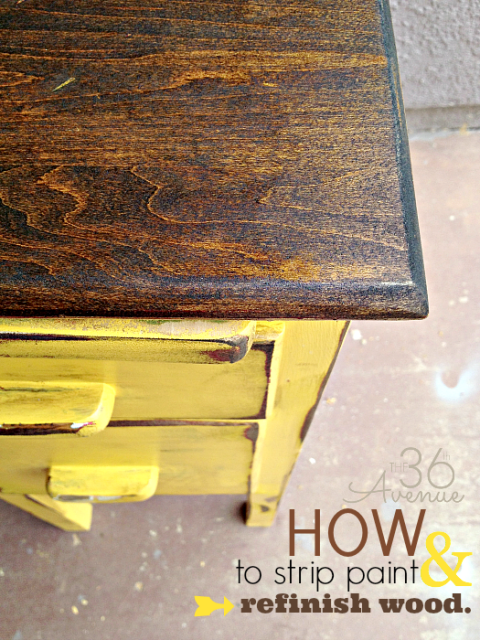 I painted the entire desk yellow and then I decided to bring the wood top back. Click here for the tutorial of how to strip paint from wood. 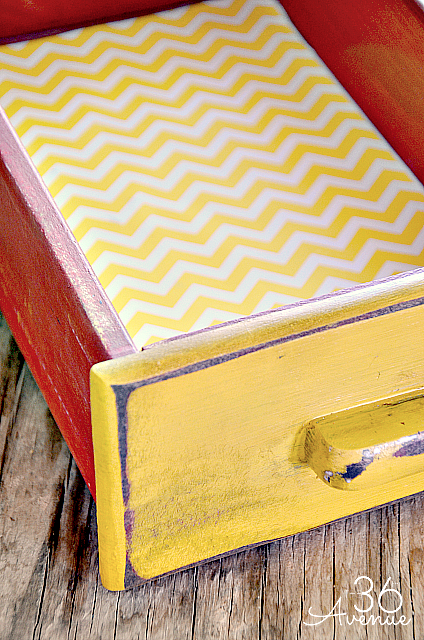 I left the inside of the drawers red and I added a little chevron wrapping paper to the bottom of it. Little things like this can bring a bit of sunshine to your work day! There I stored my most basic supplies such as pencils, stapler, sticky notes, and chocolate. Another great addition to a small working area is a cubby. They are perfect to hold mail and those items that you use often. I spray painted mine and I think it is adorable! Because this is an open area I wanted to be not just functional but cute. 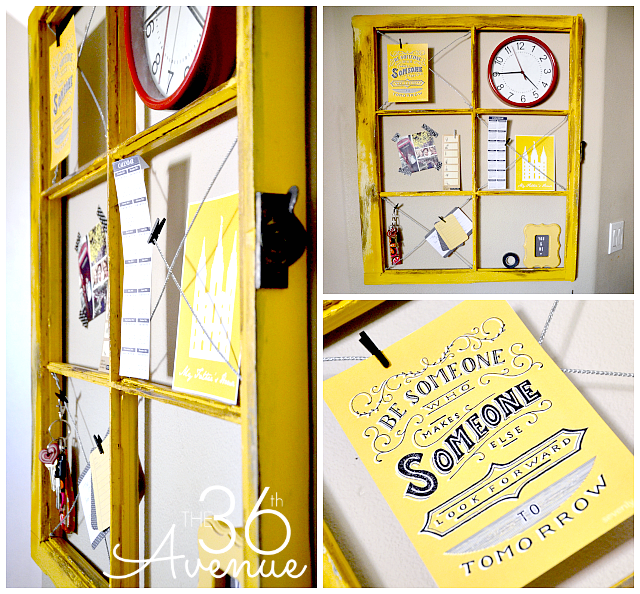 So instead of using a regular pin board I came up with the idea of using an old window as a bulletin board. I love the look and it took me like 20 minutes to do it. This is such a quick project. I first spray painted the window, the color is Valspar Flat Caramel Honey. 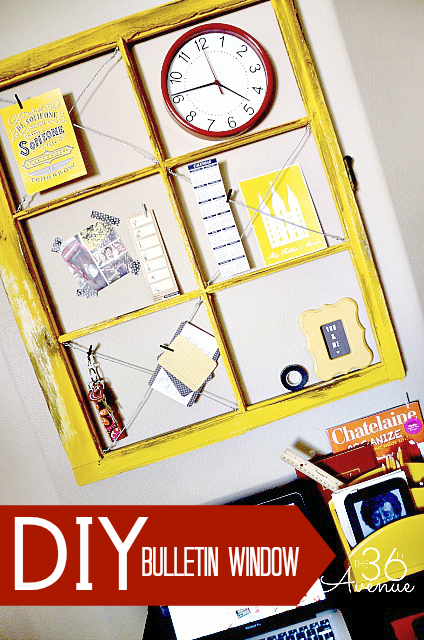 Then I screwed the small hooks in the corners of the window and I used wire to create a place to hang things from. 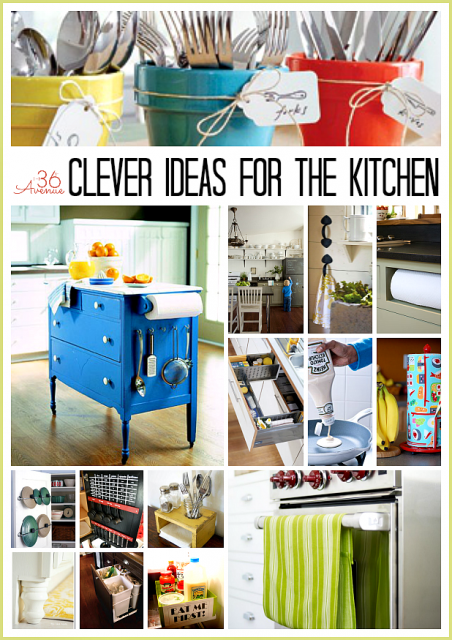 You can find all these items over at Lowe’s… I love that store! Ready to hang and hang things on it! 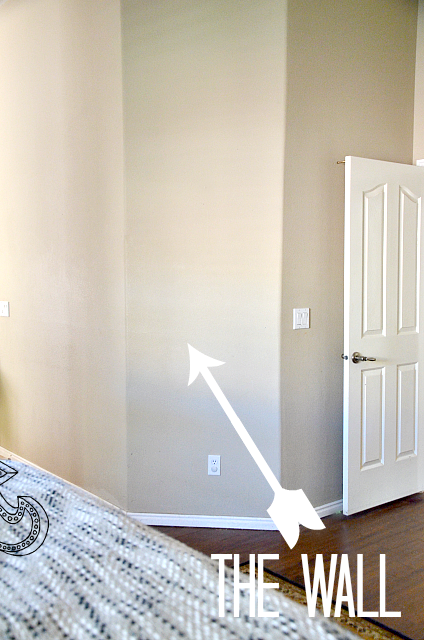 So there you have it… I hope this post inspires you to look at your own walls and see a world of possibilities! 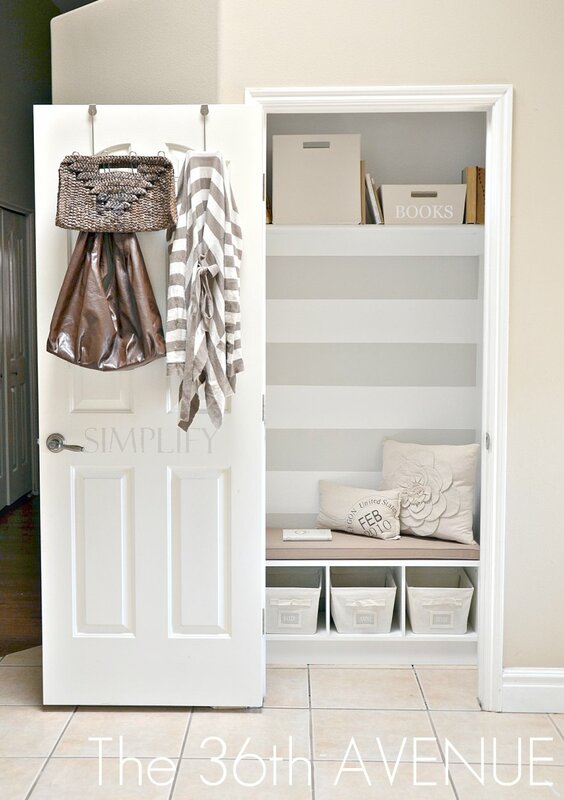 Before you go also take a look of how we turned a closet into a small mud room area. 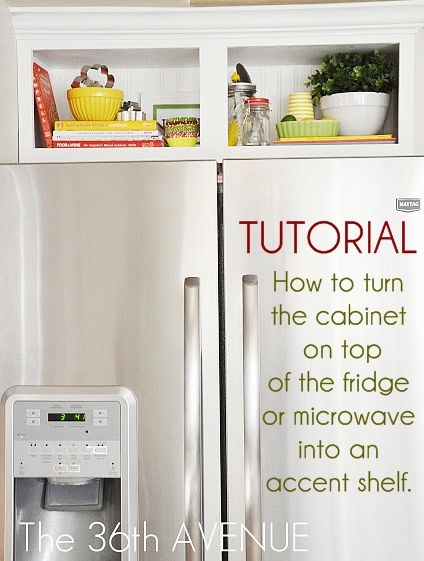 Also click here to see how to turn the cabinet on top of the fridge or microwave into an accent shelf. And since we are in the kitchen also check out these amazing organization ideas here… So clever! Thank you friends for visiting with me today! I want to invite you to pin with me! That yellow is fabulous! And I love your idea of putting the open shelving above the fridge. looks great! I absolutely love the bright colors! I also have a small office area, which I share with the hubby because he works from home. So I take the smaller wall space, but you have inspired me to make it my own and brighten it up a bit. Hopefully he won’t mind the turquoise I’m planning 🙂 Maybe I’ll add a little orange and he’ll think it’s inspired by his favorite football team 😉 Thanks for sharing and the idea! Love the pop of happy color!!! I can totally see you sitting there. When we moved I had to give up my full office & I’m now in a nook in our bedroom. I had created a cute chicken wire frame to pretty the space- which has turned into a bulletin board for things I can’t forget. All the cuteness is gone so I can maximize functionality at the moment. I so can’t wait to find our final home so I can have an office space again. So cute! Love the yellow, just so happy! Looks so inviting and clean. A great place to work at! Looks awesome!! Love the bright yellow. That ‘Be someone’ print is just great!